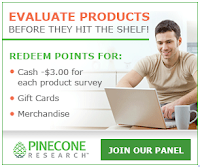 Sign up for PineCone Research - Get Paid To Take Surveys and Test Products. PineCone is #1 rated and everybody's most favorite survey company. You can earn as much as $3.00 per survey, they are generally short and quick, and they usually send out a lot of them. They also frequently have great opportunities to test products for free as well. Really great company. Taking surveys is a really great way to earn some nice extra money while you are online. Click here for the full list of all the best Survey and Product Testing Companies that pay you for surveys and product tests. Nice big list of only the best companies so you aren't wasting your time.